WALKER, James David, (grandson of David Walker, nephew of John McLean [1791-1830] and Finis Ewing McLean, cousin of Wilkinson Call, and great nephew of George Walker), a Senator from Arkansas; born near Russellville, Logan County, Ky., December 13, 1830; attended private schools in Kentucky and Ozark Institute and Arkansas College, Fayetteville, Ark. ; moved to Arkansas in 1847; studied law; admitted to the bar in 1850 and commenced practice in Fayetteville, Washington County, Ark. 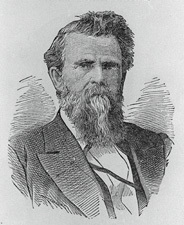 ; judge of the circuit court, fourth judicial district; during the Civil War served as colonel of the Fourth Regiment, Arkansas Infantry, Confederate Army; captured at Oak Hills, Mo., in 1861 and imprisoned for two years; resumed the practice of law in Fayetteville, Ark., in 1865; solicitor general of the State of Arkansas; presidential elector on the Democratic ticket in 1876; elected as a Democrat to the United States Senate and served from March 4, 1879, to March 3, 1885; declined to be a candidate for reelection in 1884; resumed the practice of law in Fayetteville, Ark., and died there on October 17, 1906; interment in the Walker family cemetery.